Friday at the Louis Vuitton America’s Cup World Series Portsmouth started in spectacular style with the world famous Red Arrows wowing the crowds across Portsmouth’s seafront with an outstanding display of aerobatic skill. On the water, Friday is designated official practice day, with four practice races taking place and the first two contests were dominated, appropriately, by Sir Ben Ainslie and his Land Rover BAR team. Under the watchful eye of Prince Philip, the Duke of Edinburgh, Ainslie raced out to two quick wins. Light wind conditions greeted the teams as they took to the water, but the sizeable crowd was treated to exciting competition in the warm sunny weather over Portsmouth on Friday afternoon. The first race of the day was dominated by a powerful performance from new father Sir Ben Ainslie and his Land Rover BAR team, finishing almost one minute clear of Groupama Team France and just under two minutes ahead of Softbank Team Japan. 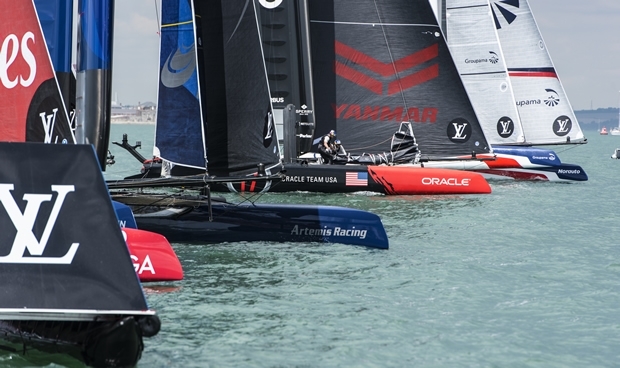 After a slow start, Jimmy Spithill’s Oracle Team USA fought back to fourth, just ahead of Artemis Racing, with stand-in helmsman Francesco Bruni, making his debut with the Swedish outfit. Rounding up the pack was Emirates Team New Zealand, with new helmsman Glenn Ashby still looking to find his way, driving the Kiwi boat to sixth place. In race two Emirates Team New Zealand crossed the start line ahead of the pack, but they were a split-second ahead of the official start time and so had to take an immediate penalty, leaving Groupama Team France, ORACLE TEAM USA and Softbank Team Japan to fight it out for first place at mark one. Good use of the wind conditions and local knowledge helped the British team overtake both the US and French crews, and at the halfway point of the race Land Rover BAR were back in front, leaving Groupama Team France and ORACLE TEAM USA to fight it out for second. Ainslie’s crew built on their lead and again finished in first, 54 seconds ahead of Spithill’s ORACLE TEAM USA in second and Franck Cammas and the French team in third, showing good consistency on day one of the regatta. Dean Barker’s Softbank Team Japan were fourth and the last two places in race two were again filled by Artemis Racing and Emirates Team New Zealand in fifth and sixth places respectively. After a short break, race three started with Groupama Team France making it three out of three as the first team across the line, but Artemis Racing were quickly ahead and rounded mark one ahead of the pack. Bruni and the Swedish team consolidated their position in first and they and Softbank Team Japan took off into the lead, leaving Emirates Team New Zealand in third, looking stronger in race three than they had in races one and two. Softbank Team Japan picked up where they had left off in Chicago taking a win in race. Behind them, Emirates Team New Zealand were second, a good fightback from the disappointments of the first contests, and Land Rover BAR were third, demonstrating that the only thing predictable about America’s Cup racing is its unpredictability. Finally, Groupama Team France, Artemis Racing and ORACLE TEAM USA were fourth, fifth and sixth respectively, wrapping up Friday’s practice races. The final action on the water on Friday was the Substitute Race, which may be inserted into the international broadcast if racing is delayed over the weekend, and at that point it would be scored as an official race. Until that point it is the fourth practice race of the day and was won by Emirates Team New Zealand, making up for their previous three races in aggressive style. The Japanese crew were also on a roll, battling with Land Rover BAR and holding off the home team for second place, with the Brits in third, capping off a fine Friday for the home fans.